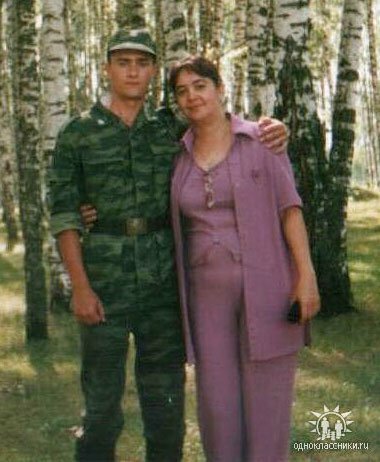 For years the Russian NGO Mother’s Right Foundation has been documenting widespread cases of bullying in the Russian army. It made special efforts to document drastic incidents in which young conscripts died and their superiors did their best to cover up what had actually happened and Mother’s Right lawyers represented relatives of the victims in the Russian courts and at the European Tribunal in Strasbourg. But Russian public opinion became so used to the volume of information about the cruel reality of daily life in the Russian Army daily life that the sharpness of its reactions was dulled and outrage rarely expressed. Recently Mother’s Right decided to adopt a different approach. 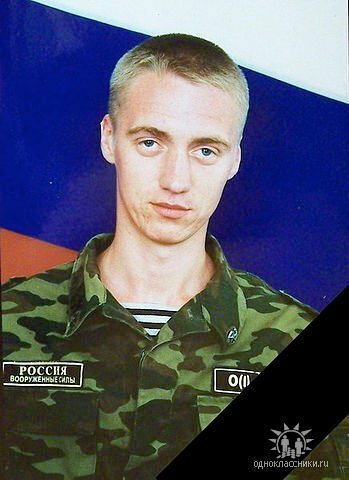 The Foundation used the highly popular Russian social network http://www.odnoklassniki.ru to publish selected profiles of young men who died while serving in the army. They were no longer alive, so couldn't write anything themselves, but the Foundation decided to present their profiles in the first person, as though originally written by the victims. The “I was found hanged at my post” formula seems to have worked: the Russian media has focused a great deal of attention on the publications. There were reports in major newspapers and radio stations and army commanders have once more been made to understand that Russian public opinion is not prepared to accept what goes on in the military. Another demonstration of the growing power of the Russian web. About me: After graduating from college I went to work to help my mother, a diabetic who requires insulin. I became a mechanic, servicing and repairing railway carriages. I went to work on the west Siberian railway. A year later I transferred to work at the energy and electricity company Novosibirskenergo. I liked drawing, I played the accordion, and I took part in amateur dramatics. Kochenevo School no.2 (1995 – 2004). N. A. Lugin Professional College no.10 (railway), Novosibirsk (2004 – 2007). Conscripted into the army in May 2008, I did my military service in unit 52410 in Zabaykalsky Krai. I died on 22 July 2008 – cause of death: reflexive heart failure (due to a very strong blow to my chest delivered by the senior sergeant of the unit, Alexander Baranov). On 9 October 2008 Baranov was sentenced by the Bezrechnensky garrison military court to eight years imprisonment in a maximum-security corrective colony, in accordance with points “a” and “b” of section 3, article 286 (exceeding his authority) of the Russian Criminal Code and section 4, article 111 (deliberate causing of serious harm, resulting in the death of a person by negligence) of the Russian Criminal Code. A complaint about the court’s refusal to compensate my mother for moral damages has been filed with the European Court of Human Rights in Strasbourg. Before being conscripted I worked at Ulyanovsk Ammunition Factory. I was conscripted into the army on 22 June 2006. I first joined training unit 83421. My troubles began when I decided to stand up for another soldier who had been beaten up. The result of all that was that the beaten soldier became handicapped, the guilty one was sentenced to a year in a disciplinary battalion, and I ended up in hospital with a broken jaw. At the end of December I joined the so-called “elite” unit 83420, where everyone found out about the incident. Hazing began and they insisted that I was a “rat”. After many beatings I developed haematomas, and then after a blow from a stool the doctors said that they were threatening to grow into a sarcoma and I should be discharged from the army. I didn’t survive to be discharged. I was found dead with a belt around my neck. In connection with my death Private Konstantin Roslov from unit 83421 was charged according to article 335, part 3 (hazing resulting in serious consequences). Roslov was found guilty and sentenced to five years’ imprisonment in a corrective colony. Village of Maly Gozek in Kilmezsky District of Kirov Oblast. About me: My mother died when I was very young and my father raised me. I was his only son. After finishing school I went to work on our collective farm as an unskilled labourer, but our village was falling apart in front of our eyes and all the young people were leaving. When I got into the army I decided to sign a contract and become a military man. I liked reading, mushroom-picking and fishing. 1. School in Maly Gozek in Kilmezsky District of Kirov Oblast (1994-1997). 2. Kirovo-Chepetskaya Boarding School (1997-2001). 3. Secondary school in the village of Paska in Kilmezsky District of Kirov Oblast (2001-2002). Unit 3642 (24.05.2005 – 18.04.2006). I was conscripted into the army on 24 May 2005, and did my military service in Unit 3642 in the Ministry of Internal Affairs forces. I was not treated according to the regulations in the unit. On 16 April 2006 I had a conflict with a more senior conscript, D. N. Bystrevsky. On parade that day we had been issued new uniforms, and Bystrevsky – he was stronger than me – forced me to give him my new uniform. I was left with marks from the beating after that incident. On April 17-18 2006 I was on guard duty. The commanding officer on guard was Lieutenant A. Y. Vodolazko. He was supposed to send me a replacement at midnight, but I was only relieved at 1am, and at 2am I had to go back to my post again. I only managed to sleep for 20 minutes, and I was very tired. I was found hanged at my post. On 27 June the Volgograd Garrison Military Court pronounced sentences for the criminal case associated with my death: Bystrevsky received two years’ imprisonment and Vodolazko two years suspended. Village of Knyazhi Gori in Tver Oblast. I was from a very poor family. I had two sisters and our mother raised us alone. While studying, I always did some work on the side to help the family get by. I had no time for hobbies or fun. In my seventh year of school I dropped out so I could start working. Work with equipment – investigating and examining engines, repairing them – that was for me. I studied at technical school to be a mechanic, and then got work as a tractor driver at the Rapeseed Institute in Lipetsk. When I grew up I developed a plan for pulling us out of poverty: I would serve in the army, come back and work in Moscow. So our whole family moved from Lipetsk Oblast to Tver Oblast to be closer to Moscow. Our living conditions there were very cramped, but but as temporary digs for my mother and sisters while they were waiting for me to come back from the army it was ok. My mother got work with a logging company, nailing wooden boxes together. It was hard physical work, and her pay was very low. I was supposed to come back and help my family. 1. Alanbay School (village of Alanbay in Zarinsky District of Altai Krai), - 1985-1986. 2. Secondary school in the village of Knyazhi Gori (Zubtsovsky District of Tver Oblast) - 1986 - 1993. 3. Pyatnitskoe Secondary School (village of Pyatnitskoe in Izmalkovsky District of Lipetsk Oblast) – 1992 –1993. 4. Special Professional and Technical College _ 18 in the village of Chastaya Dubrava in Lipetsk Oblast, specialty “mechanic” – 1993-1994. Unit 62892 (11.05.1998 – 7.10.1999). I was conscripted into the army on 11 May 1998 and did my military service in unit 62892. I was sent to do my service in Dagestan. There on 7 October 1999, during combat reconnaissance, our vehicle was hit and I died along with another guy from Altai Krai. My mother found out about my death not through official channels, but completely accidentally from an acquaintance, who had by chance caught the news from someone else. Neither my unit nor the military recruiting office sent her any notification. My mother first went to Lipetsk Oblast, thinking that they would bring me to my old address, but then she found out that she had to go to Laboratory 124 in Rostov-on-Don. It took about two months for my body to be given back to my family. On 16 December 1999 I went home freight class on a train and the transit document stated: “type of consignment: coffin with the body of a Ministry of Defence serviceman, number of places 0001, weight 00300 kg, cash amount – 000000 roubles, declared value – 000000 roubles”. On 18 December 1999 my mother buried me. Village of Novoalexandrovka in Morshansky District of Tambov Oblast. I enjoyed karate. I was a creative person – I wrote music, poems, stories and essays. I liked computers and radio equipment. I really wanted to get a higher education. Studying always came easily to me. I planned to take a correspondence course and work so as not to live off my parents. And I had a dream – to record an album with my sister Ksyusha, who has a wonderful voice. I would write the music and lyrics, and she would perform them. Before graduating from technical college I drove a combine harvester with my father every summer in the holidays, helped my parents to get a car, and earned enough to buy myself a computer. After graduating from technical college I worked at the Volkovsky alcoholic beverage plant as an electrician. 1. Volkovka School (village of Volkovka in Morshansky District of Tambov Oblast) – 1993-2003. 2. Professional College no.17, Tambov, (2003-2006). Training Centre for the Military Academy of the Russian Federation, 420th training ground (19.06.07 – 16.05.08). I was conscripted into the army on 19 June 2007. On 16 May 2008 I was killed as a result of a shell explosion on the training ground. The story of my death is not clear though. One of the women who worked in the unit called the Mother’s Right Foundation anonymously and said that the officers had sent me to pick up the metal that was left on the training ground after shooting, and the grenade that exploded in my hands was old and rusty. She also said that after my death the lights were on all night in the headquarters building: she presumed the officers were faking documents to present my death as my own mistake. This woman was angry about what had happened and upset for my parents, but nevertheless she refused to appear as a witness in the case and give evidence officially. The criminal case led nowhere: the military hid the truth and no-one took responsibility for my death. Subsequently officials from the Department of Labour and Social Development of Tambov Oblast refused to give my parents the social support they were lawfully supposed to. My parents finally won their case on 24 March 2009 in Morshansky District Court, Tambov Oblast. I planned to sign a contract and stay in the military. I wanted to be a soldier. I enjoyed sport – volleyball and basketball – and I enjoyed hiking in the hills and rafting on the Belaya River with my friends. 1. Tyulgan School no.1 (village of Tyulgan in Orenburg Oblast) – 1990 – 1995. 2. Ermolaevo Secondary School no.2 (village of Ermolaevo in Kuyurgazinsky District of the Republic of Bashkortostan) – 1995-2000. 3. Kumertau College of Aviation (town of Kumertau in the Republic of Bashkortostan) – 2001 – 2004. 1. “Kuyurgazinsky Agrosnab” – 2000-2001. 2. District department of education for the village of Kuyurgaza in the Republic of Bashkortostan, job – “energy specialist” (2004 – 2006). 3. Ochakovo Beer Factory, Moscow, job “energy specialist for installation of beer line” (March, April, May 2006). Unit 345 (training unit in the Jewish Autonomous Oblast, east Siberia), 25 May – 15 November 2006. Unit 26381 (15 November 2006 – 10 January 2007). I was conscripted into the army on May 25, 2006. After training, in which my service went normally, on 15 November 2006 I was transferred to unit 26381 in Amur Oblast. That was when, as far as my friends and relatives were concerned, I disappeared. My mother started looking for me to find out what unit I was in and its telephone number. On 11 January 2007 she was called from the unit and told that I had disappeared on 9 December and that on 10 January I was found hanged outside the unit in a forest. “He settled his accounts with life”, the commander of the unit told my mother, but she didn’t believe it. When I was brought home she found multiple bruises on my body and saw that my temples were grey. The investigation into the criminal case concluded that I had killed myself because of a beating by a junior sergeant from unit 26381, Alexander Fomin. On 18 July 2007 he was sentenced by the Belogorsk garrison military court to 3.5 years’ imprisonment. But there is still a lot that is unclear in the story of my death: the five volumes of the criminal case do not give anything like a clear picture of what happened. I loved living and was in a hurry to live – every day I was eager to find out something new. I enjoyed getting together with my friends. We played the guitar, sang songs and laughed a lot. I enjoyed sport – swimming, karate and judo. I was in a model aeroplane club at school. I was keen on photography. I liked cooking good food for my friends. 1. General School no.66 in Gorky [now Novgorod] (1982-1990). 2. Institute of Higher Professional Education _ 5 (professional school) in Nizhny Novgorod, speciality “machine operator for communications systems, general machinist 4th class” (September 1, 1990 – June 30, 1993). 3. Gorky Automobile School of the Voluntary Association for Assistance to Army, Air Force and Navy no.2 (22.02.1993 – 19.06.1993), received professional driver’s licence. 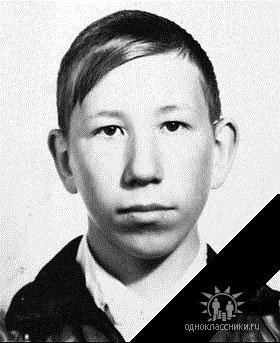 Worked as a salesman for the private employer “Elizarovy K. I.” (26.08.1993 – 04.12.1993). Unit 48427 (05.12.1993 – 08.01.1995). I was conscripted into the army on 5 December 1993. In December 1994 I was sent to Chechnya. 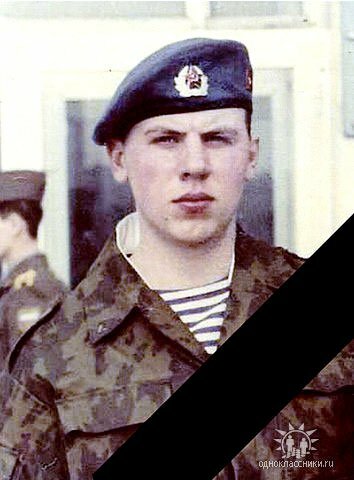 On 8 January 1995 I was killed in Grozny in the grounds of a cannery. At first my parents were told that I was wounded and in hospital. My mother called all the possible hospitals, but she didn’t find me. My father, who had served in Afghanistan in his day, went to Chechnya to look for me, but he couldn’t find me. After he came back from Chechnya, my father developed acute leukaemia, presumably at least partly brought on by the severe stress, and died a week before his 46th birthday. When he was dying, he told my mother to look for me. I had in fact been sent as “Cargo 200” [in a zinc-lined coffin – ed.] to the village of Uryupino in Altai Krai under the name “Zhenya Ventsel”. 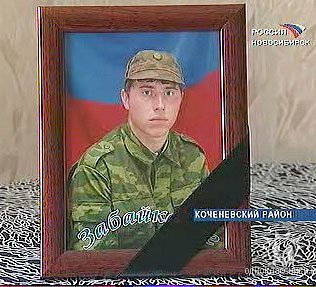 Zhenya Ventsel was a fellow soldier who was killed with me in the same battle. Zhenya’s parents didn’t want to open up the zinc and so buried me in the village cemetery, thinking that they had buried their son. My mother called all the possible hospitals, travelled to Judicial-Medical Laboratory 124 in Rostov-on-Don, but her searching was fruitless, at least in my case. But at the same time, while in Rostov she helped a few other mothers find the bodies of their sons and husbands. With great difficulty she managed to track down my surviving comrades, who told her that my body had been mixed up with Zhenya’s. For over four years my mother tried to get an exhumation and identification of my remains. She flew to Altai Krai several times, and in 1997 employees from the Mother’s Right Foundation flew with her to see Ventsel’s parents. 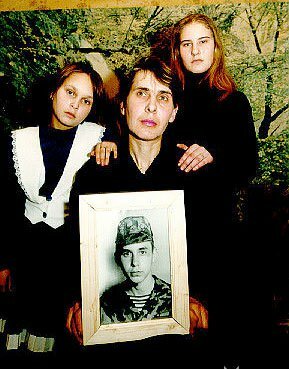 Finally, in 2000, after banging on every possible door, picketing, participating in Svetlana Sorokina’s TV programme and meeting with the prosecutor general of Russia, Yuri Skuratov, my mother at last succeeded in getting an exhumation. To conduct the examinations my mother was told that her blood and the blood of my sister were insufficient, and they ordered the body of my deceased father to be removed from his grave. My mother had this done. After seven years it was confirmed: I wasn’t Zhenya Vintsel, but Serezha Tumaev. On 19 March 2001 I was buried in my home town of Nizhny Novgorod, 20 metres from my father’s grave. For my mother’s suffering the Nizhny Novgorod court awarded her just 20,000 roubles.